Providing opportunity for your children to develop their imagination is important. It should be a freedom that you fight to find space for in the busy schedules that we impose upon them today. They desperately need that freedom to unplug and time to spend exploring and discovering who they are. The imagination doesn’t just appear. It requires development. And it requires practice, just as developing a perfect swing, learning to speak a foreign language – really building any skill – does to become muscle memory. When a child’s imagination is improved, their aptitude for creative thinking and problem-solving is also improved. They are on a path to self-discovery. Because today’s full-speed culture doesn’t really lend itself to “unstructured downtime” that developing the imagination requires, it could help you to think of ways you might spark your child’s imagination. You can believe in boredom. Don’t fall for the belief that your child must be busy learning all the time. No free time means downtime. No time to get bored. And when you don’t even have the time to get bored, you don’t have the freedom and space to imagine. Let your child be unengaged. Let your child wonder. Let them have free play. Take away the pressure to do and let your child explore. This is one of the best gifts you can give your child. 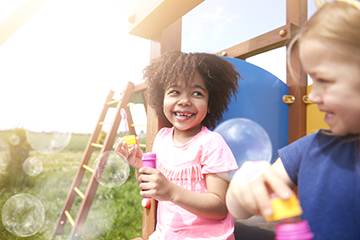 Free play has been shown to boost confidence, problem-solving skills, resilience, and social-emotional connections. Make sure your there is screen-free time. Real downtime has nothing to do with a screen – TV, computer, video game or smartphone – and everything to do with freedom and space, wonder and exploration. It can be challenging but being adamant about this will help you child develop imagination, communication skills, and curiosity. Meals are an easy way to begin screen-free time – since this time should be screen-free anyway! Get creative and include yourself. Designate a basket where all screen devices (except the larger TVs) will be placed during screen-free time. This includes your own devices! When you participate, you will be surprised at how much you will benefit from your own freedom to imagine. Build play into the day. Make time for little spaces for play. Maybe it’s before bath time or bedtime. Maybe it’s on the way to school (which can be a designated screen-free time)! Tell jokes, share riddles or play “I Spy.” Take a few minutes to visit a garden that is along your way to look at vegetables and flowers and the nature around them. You can even start the day with a fun riddle that immediately sets your child’s imagination off. At first your child may think entertaining themselves without a screen will be impossible. You may meet up with resistance. You can help by creating an inspiration basket full of items that are thought provoking: dress-up items, bubbles, chalk, craft supplies like pipe cleaners and poms or cotton balls. A challenge is a great way to get the mind clicking so why not inject them into your everyday life. If you don’t think of them on the fly very well, make a list. It really is easy because almost activity can be turned into a challenge. And a challenge is the perfect time for your child to use his or her imagination to come up with different ways to meet your challenges. You might even ask how many ways the challenge could be solved. They need diversity in play. Share diverse types of play with your child, whether it’s pretending or acting, creating a scenario or experimenting with a toy or doing something physical or creating a competition. Play alone or with others of the same age or different ages, indoors or outside, in parks or in the car – I think you get the idea. Give them tools to succeed. Using the imagination – in the truest sense – involves nothing else at all, but sometimes enhancing that experience with some sort of “prop” can make the event even more inspiring. Props can come from the child’s toys arsenal or from interesting items around your home or in their environment. If you notice particular toys that are stifling to their creativity, “rotate” them from their toy box. Your mission is to make sure they have plenty of playthings that promote open-ended, imaginative play, and that can grow with children through multiple stages of development. Be patient with your child and yourself. This may not come easily for either of you. In fact, it may seem like a battle at first. Take a step every day and those magical moments of imaginative, free play will happen. When they do you and your child will be even more inspired and determined to make them happen more often. Would you like to see how a child’s imagination works? © All Contents Copyright 2009-2019 Little Otter Swim School.